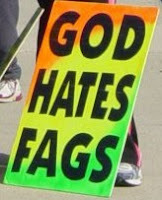 On March 10th, 2006, seven members of the Westboro Baptist Church attended - and picketed - the funeral of Lance Cpl. Matthew Snyder, who had tragically been killed in Iraq. A few months later, Albert Snyder, the fallen Marine's father, brought suit against them alleging defamation, invasion of privacy, and intentional infliction of emotional distress. The lawsuit is believed to be the first against the church by a fallen service member's family. Having been denied two consecutive motions to dismiss the case, the church headed to trial today in Baltimore. The outcome may have implications for the group's future activities, which continue to raise hackles and provoked a group of people calling themselves the Patriot Riders to visit targeted funerals in order to help prevent the WBC from interfering. For those who are unfamiliar with the Westboro Baptist Church, it is a small congregation in Topeka, Kansas that revolves around the group's patriarch, Fred Phelps. They claim to have conducted over 32,000 demonstrations at various events since 1991, the vast majority of which have centered around condemning homosexuality and preaching God's hatred for what they call, "fags" and "fag-enablers." Since 9/11, the group has been picketing the funerals of fallen soldiers, sailors, marines, and airmen, carrying signs that read like a veritable smörgåsbord of hate. Some examples include "Thank God for IEDs," "Fag Troops," "You're Going to Hell," "Thank God for Dead Soldiers," and, of course, "God Hates Fags." Mr. Phelps and many members of his family are also trained lawyers (though Mr. Phelps himself was disbarred in 1979), and are no strangers to lawsuits in other contexts. They are strictly Calvinistic, believing in the five pillars of Calvinism and the doctrine of predestination. Their narrow public focus on homosexuality stems from the increased acceptance of homosexuals in society, which they interpret as a violation of God's Law. According to their FAQ page, "God does not hate them because they are homosexuals; they are homosexuals because God hates them." They've also picketed various churches (including one in Frederick, MD), the funerals for the victims of the Amish school shootings, those related to the Virginia Tech shootings, and the funerals of those who died in the 35W bridge collapse in Minneapolis, MN. There is really no need to highlight the various inconsistencies in their position, and they are damned by their own words as apparently having no compassion for anyone but themselves. What is truly curious is that this group knows their Bible very well. Though others might disagree with their interpretation (or disregard the verses entirely), one remark on their website actually sums up many non-believers' perceptions about the Bible: "For every one verse about God's mercy, love, compassion, etc., there are two verses about His vengeance, hatred, wrath, etc." Those who've read the Bible carefully recognize the truth of this statement. The attention paid to the group is disproportionate to their size, but as the saying goes, the squeaky wheel gets the grease. It will be interesting to see how this trial plays out, and whether the group will suffer any consequences that will proscribe their activities.